In yet another weird Wieden + Kennedy-directed gimmick, KFC will provide one lucky (and, likely, rich) person with an expensive way to escape this year’s holiday tech-driven mayhem. KFC is selling one “Internet Escape Pod” for $10,000 on its website. Yes, you read that right. In an effort to help people (read also: one person) relieve some of the stress of the holiday season—i.e., Black Friday, Cyber Monday, awkward family gatherings and seemingly never-ending celebrations—the fast-food chain known for its buckets of fried chicken developed something totally new. 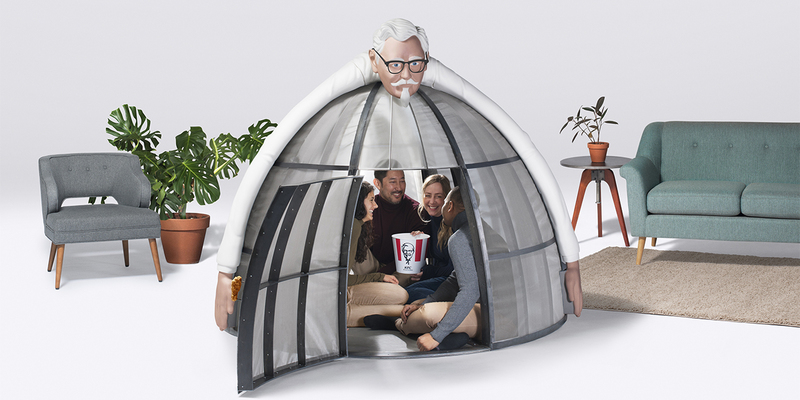 KFC describes its “isolation pod” as as an internet-free safe space (complete with the loving embrace of Colonel Sanders), and it’s selling it to one customer on a first-come, first-served basis. As of the writing of this article, the pod hadn’t been sold yet, likely because dropping $10,000 on a KFC-themed metal tent during the holiday season is enough to cause a mountain of stress for the average U.S. consumer. Either that, or the people who could afford this thing are more likely to spend that money on an actual, real vacation. You could just turn off your phone and go for a free walk, but that option does not come with a fried chicken-leg doorknob. And, hey, the offer is a steal, according to George Felix, director of advertising at KFC U.S.
“We were going to sell this for the ridiculously high price of $96,485.34, but in the spirit of the season, I said, ‘nah, let’s make it a deal,’” Felix said. How generous. But why does KFC think this product is worth spending more than a chicken arm and a leg on? Well, it’s an eight-pound stainless steel mesh cave that, with high-density architectural foam and enamel paint, disrupts Internet workings inside. The pod comfortably sits four adults and a bucket of Kentucky fried chicken, according to the company. Some scenarios in which KFC suggested you could hide in the pod for include Cyber Monday push notifications, calendar updates for the dozens of ugly sweater parties you were invited to and reminders of your single status from countless dating apps (hopefully you choose anyone other than the straddling Colonel to kiss when the ball drops on New Year’s Eve). Weird as it may be, this stunt isn’t exactly unexpected from Wieden + Kennedy. The independent agency can be thanked for most other of the company’s wacky campaigns, including Tender Wings of Desire (KFC’s 96-page romance novella written by Colonel Sanders for Mother’s Day). Of course, we can’t forget the agency’s most recent gimmick: KFC quietly following just six men named Herb and the five women of the Spice Girls, 11 herbs and spices, on Twitter.